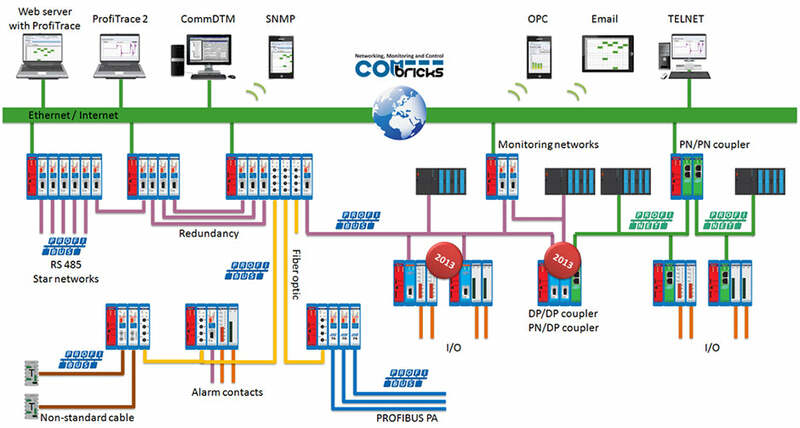 ComBricks is a universal platform for PROFIBUS DP, PROFIBUS PA and PROFINET. Through the combination of ComBricks modules, a wide variety of applications are possible, including network monitoring and troubleshooting, repeater backbones, PROFIBUS DP/PA couplers, remote I/O, fiber optic links, and many more. 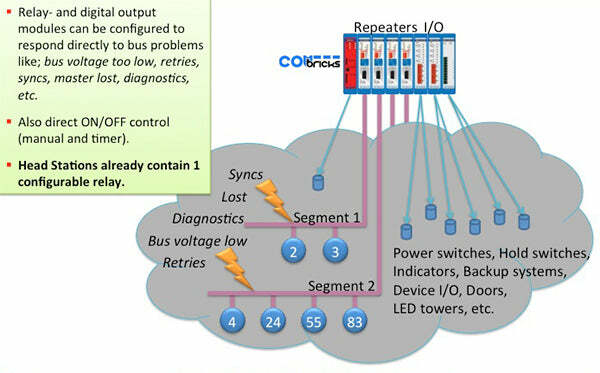 Moreover, these functions can be combined and run simultaneously from a single ComBricks system! This overview of the many features and uses of ComBricks illustrates how you can unleash the power of its flexible modular backplane to address your existing networking issues or create new innovative network topologies and applications. 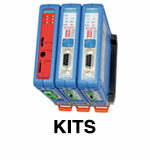 Every ComBricks system has exactly one Head Station, which is the red module you see on left of every system. 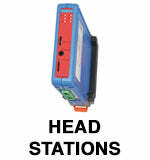 The Head Station is the control unit of the system and has the connections for power supplies, Ethernet connectivity, and USB. The various ComBricks modules communicate with the Head Station over the backplane. But what makes the ComBricks units unique in the market are the powerful features the Head Station brings, and the endless combinations of modules to you can use to build up a system. Through its powerful backplane, the ComBricks Head Station has connections for 4 PROFIBUS Networks, High Speed Ethernet for communication with PROFINET networks, I/O channels and more! Snap modules together to build a ComBricks system for one or more of these applications and run them simultaneously! ComBricks takes many of the powerful features of ProfiTrace and allows you to access them remotely using a web-browser from anywhere in the world. This version of ProfiTrace, called ProfiTrace OE (over-Ethernet) is optionally available and runs from the Head Station. 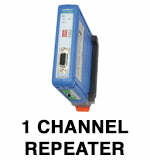 This gives you the power of monitoring up to 4 PROFIBUS networks through a single ComBricks Head Station. Even more impressive is the ability to check oscilloscope images. 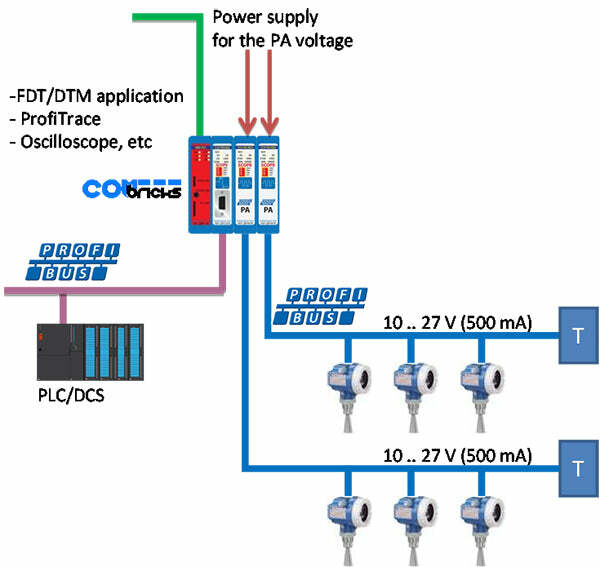 Since all segments are electrically isolated, each segment needs its own oscilloscope to check the signals on that segment. 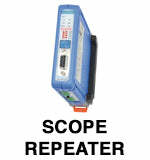 This is accomplished through the use of SCOPE modules, which can act as repeaters when used in combination with other modules. ComBricks is the only product in the world gives you the ability to check the telegrams for interference and reflections using a web browser from anywhere in the world. Now you cannot only monitor your installation remotely, but you can do some troubleshooting as well, and direct technicians at the plant in locating problems. Proactive maintenance is now possible with 24/7 monitoring. ProfiTrace OE can send out SNMP messages or email messages to alert you of network events. These event triggers are easily configured through the ComBricks web interface. 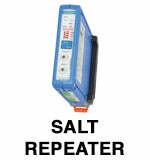 Problems such as low bus voltage, retries, syncs, master lost, diagnostic messages etc can be used with event triggers. You can even set up event triggers to open or close the relay on the Head Station. This could be used to trip a light tower, start a back-up system, sound audible alarms, etc. 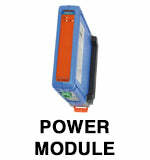 If more relays or Digital outputs are needed, there are ComBricks modules for that as well – just snap in a module and they are available for use with event triggers. 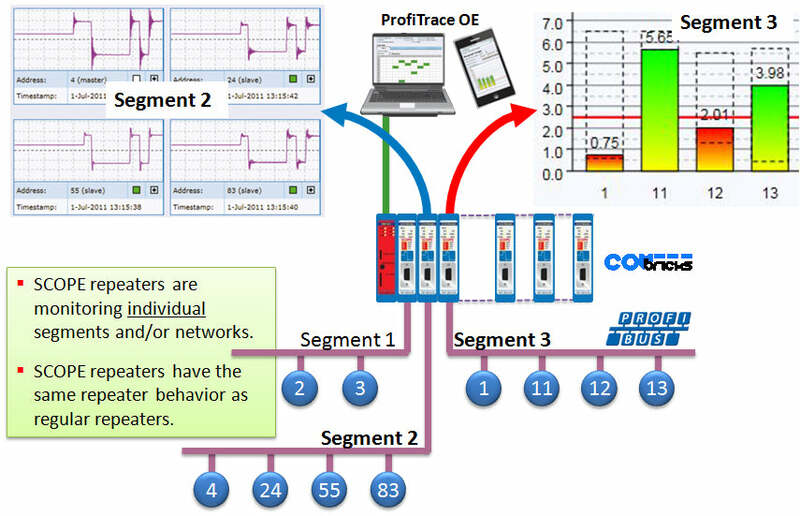 The latest trend in PROFIBUS network design is to have highly segmented networks. By using more segments, common cabling and electro-magnetic field (EMF) interference problems are isolated and their impact minimized. ComBricks’ powerful backplane allows for up to 10 hot swap repeater modules with 1 or 2 channels to be inserted (up to 20 galvanic isolated transparent segments). 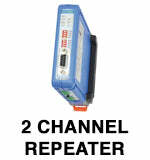 Every channel can handle 31 devices and maximum 1200 m cable length (depends on the baudrate). 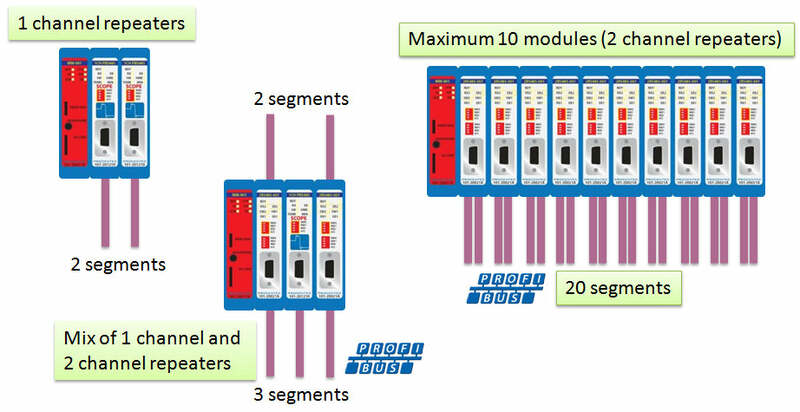 In addition, ComBricks repeaters can be assigned to one of four networks through simple dip-switches on the face of the unit. In this way you can monitor those with ProfiTrace OE from a single ComBricks system. In the illustration below, this system has two segments on Network 1, four segments on Network 2, two segments on Network 3 and two segments on Network 4. All monitored from the same ProfiTrace OE webserver. Of course you can give your networks more meaningful names in ProfiTrace, so you don’t have to remember which network is which. Fiber optics links and backbones are very useful in PROFIBUS installations where distance and/or grounding are a problem. Fortunately, ComBricks comes to the rescue again and gives network designers a unique and flexible platform for fiber optic deployment. 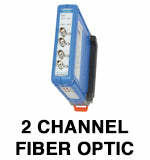 ComBricks allows you to make point-to-point fiber links up to 3 km in length. 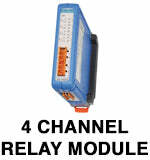 You can also mix fiber modules with Copper modules to drop off to segments with DP or PA devices. Redundant point-to-point, star and bus topologies are also possible. ComBricks provides free CommDTM software for use with FDT 1.2 based asset management tool like FieldCare and PACTware. 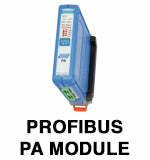 It works by providing an Ethernet pass through to access PROFIBUS devices that are connected to the ComBricks repeater modules. This is accomplished through the use of internal DP-V1 class 2 masters. 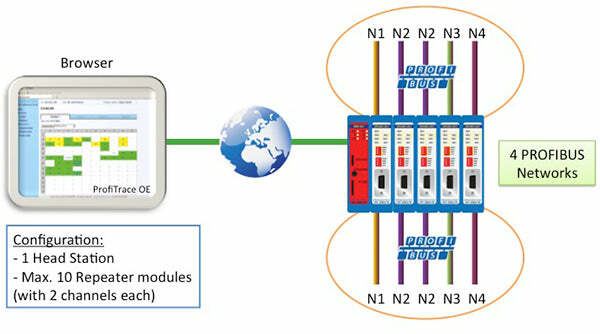 Only two of the four ComBricks networks can be accessed at a time. The ComBricks headstation supports 1 or 2 Ethernet connections for the CommDTM. All other ComBricks functions, including ProfiTrace and other features continue to work simultaneously with the CommDTM. ComBricks’ CommDTM internal masters auto-detect the baud rates of the networks, so no configuration is necessary. With the new PROFINET Module, it is now possible to use ComBricks to create remote PROFINET I/O systems, by combining the module with the four-channel relay or the eight-digital output modules. 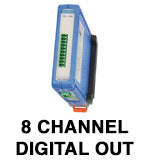 These are programmed into the PLC just like any other PROFINET device. By means of the GSD file, the respective I/O modules have to be selected in the configuration tool, after which the PLC can map the I/O’s to its applications. 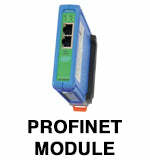 The PROFINET remote I/O application is ideal for coupling small machines into your installation. 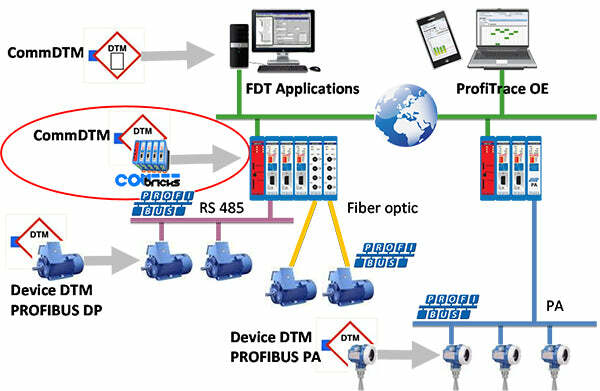 Overall, the ComBricks product family provides an innovative system for PROFIBUS DP, PA and PROFINET communications. This product family is not standing still as many new features and modules are planned for 2013 and beyond. Stayed tuned for more innovations and unique applications that only ComBricks can deliver. For more information and to see some of the ComBricks interface we have put together the video demonstration below.